LABOUR has revealed the candidate the party hopes can claw back lost ground in the Fortune Green by-election. The party has been defeated in two by-elections since losing control of the Town Hall in 2006. It is facing an uphill task to win the Fortune Green poll triggered by the death of Lib Dem councillor Jane Schopflin. 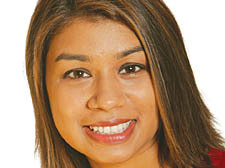 Candidate Tulip Siddiq, 25, has to make an impression in a ward where Lib Dems and Conservatives normally make the running. If elected, she would be Labour’s youngest councillor in Camden. The Greens have chosen Tim Wilmott – the party’s parliamentary candidate for the Hampstead and Kilburn seat – to fight the February 21 by-election. “Residents in Fortune Green are genuinely frustrated with the failure of Camden’s Lib Dem and Conservative coalition to tackle issues such as public services and open spaces,” he said. Front-runners in the campaign are the Lib Dems’ Nancy Jirira and the Conservatives’ Heather Downham.